Kevin Mills is Lecturer in English Literature at the University of Wales Aberystwyth, where his teaching and research interests focus on Victorian literature. He is the author of Justifying Language: Paul and Contemporary Literary Theory (Macmillan 1995) and Victorian Revelations: Unveiling Apocalypse in Victorian Writing (Bucknell University Press, 2007). 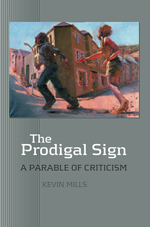 The Prodigal Sign sets out to characterise criticism as a set of prodigal practices that exceed the constraints of primary texts, history, and theory. This is not just because, as Derrida says, ‘no practice is ever totally faithful to its principle,’ but also because critics are habitual runaways – forever seeking to escape the jurisdiction of their forebears and of the academy. Always on the lookout for something new and distinctive to say about the same old texts or for texts that have escaped the professional attention of their peers, like the prodigal son, they live on their inheritance while trying to escape from their own disciplinary history. This work makes a case for celebrating the prodigal condition and for another escape – breaking out of traditional constraints towards a hybrid form that combines the critical with the creative. My friend, Kevin Mills, has run away, run away with a huge pile of books. Mind you, he has also run way from a pile of books, the same books – for what we have here is the critic as prodigal, the critic who sees in the Parable of the Prodigal Son a parable of criticism. In this book, my friend runs with the prodigal son in every sense. ‘Escape,’ he cries over his shoulder, ‘is on the agenda. Indeed, escape is the agenda.’ And so Prodigal Mills has kicked up his boot-heels and is off, legging it from a host of ‘fathers, precursors, histories, influences, … [and] institutions’ – in particular, the strange institution of literary criticism. Prodigal Mills has heard rumours of the far country they call ‘creative’ and has gone off to squander his academic inheritance in riotous writing – here we have not just escape but escapade. ... This is reckless. It may even be suicidal if dear old Matthew Arnold is to be believed: ‘Creative activity,’ he famously sighed, ‘is the promised land towards which criticism can only beckon. That promised land will not be ours to enter, and we shall die in the wilderness.’ Prodigal Mills knows this, or at least knows that all prodigals will, at some point, sit in a wilderness, feeding the swine and envying the husks that they eat. But my friend is not so sure that we shall die in the wilderness; for he knows that it is only there that we ever have the time or need to notice such as the pigs and the husks – the remnants of life, the overlooked and forgotten. ... This self is, though, hard to find, hard to gather up; for, as my friend declares, ‘I was wrecked on the way to language.’ It seems that, as some comedian might say, a funny thing happened to him on the way. Or rather, several funny things – among them: Welshness, fatherhood, unemployment, literary theory, the lyrics of Bob Dylan and, above all, religion. ‘The Bible,’ confesses our prodigal, ‘captured me in my childhood and from that I can’t escape.’ His mother, not-so invisible, read to him the story of the prodigal son before he could ever read it for himself. ... That is the question. Who? If not ‘I’ then is it ‘You’? Perhaps, for this book is forever thinking about you – it is written, I would say, You-toward. Here, there and everywhere, Mills writes things like: ‘You know,’ ‘You figure,’ ‘Your move’ – and, most tellingly, ‘You win.’ You, it seems, are one more funny thing that happened to Mills on the way to writing this book, perhaps the most funny. So: who are you ? And are you still there? Still out there ? You had better read on. One of the issues Mills grapples with is the often cool relationship between the detached professional voice that critics and scholars typically use to discuss literature, and the voice of the self that reads, thinks, laughs, cries, drinks tea, and goes to the bathroom. There are others, of course, as he applies the biblical parable The Prodigal Son to literature criticism. His perspectives include the dwarf, the broken doll, father away in the forest of books, splitting the aphorism, and parables of the republic.